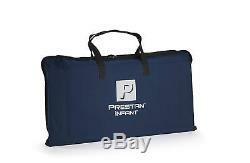 Baby CPR Trainer w Monitor Infant Mannequin Emergency First Aid Training Manikin. Rate monitor gives students visual feedback. Head-tilt illustrates how to open the airway. Realistic skin resists dirt, grime and grease. Easy-to-insert face shield lung bag speeds setup of the manikin. Realistic to the eye and the touch, the Professional Infant Manikin is unlike any other on the market. Manikins are uniquely designed as a clam shell that accommodates an easy-to-insert lung bag. The revolutionary new CPR Rate Monitor allows for instant feedback to both instructor and student regarding the rate of chest compression. This allows each student to gauge their rate of compressions on their own as well as allowing the instructor to monitor several students quickly and easily. 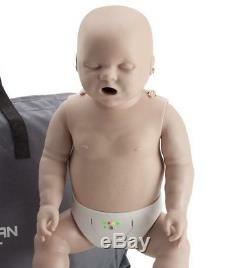 And with the patented face/head tilt, the Professional Infant Manikin simulates the way an actual victim's head would move if he required CPR. In addition, the unique construction of our manikins incorporates a mechanism to help them use the correct force to compress the chest to the correct depth. The item "Baby CPR Trainer w Monitor Infant Mannequin Emergency First Aid Training Manikin" is in sale since Sunday, August 5, 2018. This item is in the category "Business & Industrial\Healthcare, Lab & Dental\Medical & Lab Equipment, Devices\Training Manikins & Patient Simulators". The seller is "globexww" and is located in location varies, . This item can be shipped to United States.